We are expecting our second child sometime the first week in April. With my first pregnancy, the morning sickness was so severe that I couldn't eat, drink or sit up. While I still have morning sickness this time around, I am very thankful that I don't have that bad. The one thing difficult about being so far away from home is how much I miss the food. Hawaii has such a wonderful blend of ethnic food. In downtown Honolulu, you will find Korean, Vietnamese, Thai and Greek food all in the same area! What I have been craving is some good chicken pho (pronounced "fuh" in case you don't know!). 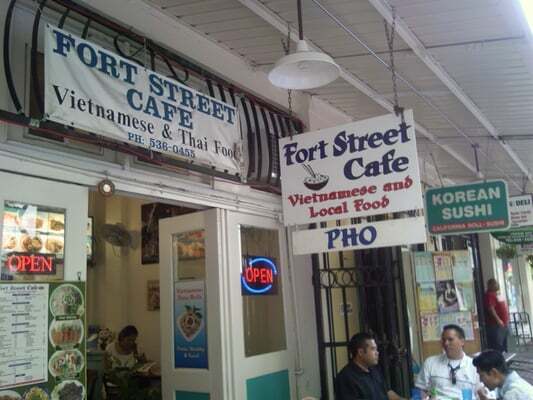 The best pho I have ever had is from the Fort Street Cafe in Honolulu, Hawaii. Even though I hadn't been home for over 4 years, when I returned last year for a visit, the owners remembered me! The couple who owns the restaurant have hundreds of customers. They are packed for lunch every day so I was surprised. 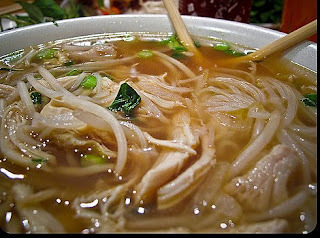 My husband is out at the grocery store right now getting all the spices, sauces and chicken I need to make my own pho. I've found a few recipes online that seem promising and hopefully the results will satisfy my current pregnancy craving :). I will let you know as soon as I find the best pho recipe!